In election season, there have been more controversial comments with religious undercurrents. Randeep Surjewala had said that Mr Gandhi is a "Janeu-dhari Brahmin"
In his latest broadside against Rahul Gandhi, BJP spokesperson Sambit Patra has controversially asked the Congress president: "What's your gotra?" 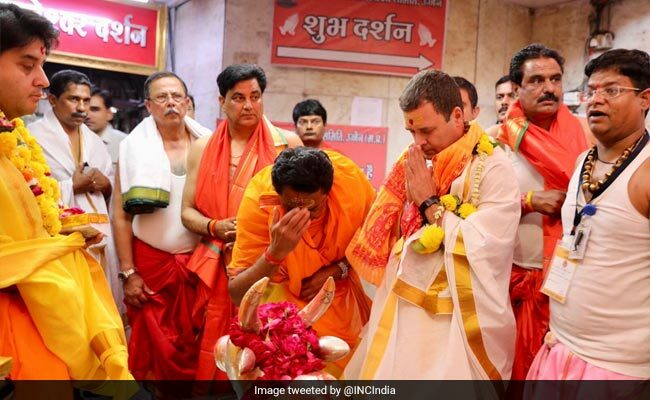 The comment is linked to Congress leader Randeep Surjewala's pronouncement after Rahul Gandhi's visit to the Somnath temple in Gujarat that he is a "Janeu-dhari Brahmin". The comment and Mr Gandhi's temple visits were criticized by the ruling BJP as soft-Hindutva for votes. "Rahul Gandhi wears a janeu (sacred thread). We want to ask him - he is going to Ujjain - what kind of 'Jenau Dhari' are you? What is your gotra," questioned Sambit Patra, speaking in Indore in Madhya Pradesh, where both the Congress and the BJP are campaigning intensely for elections to be held on November 28. The backlash on Twitter was sharp. "I'd rather he was asked what his agenda is, what his plan for job creation is, what his plan for agriculture is, what his plan to combat inflation is but if all that matters is what his Gotra is then God help us," tweeted former Jammu and Kashmir chief minister Omar Abdullah. Gotra refers to a clan or a descendant from a common male ancestor. Mr Gandhi visited the Mahakaleshwar temple in Ujjain to offer prayers on Monday. Exactly a year ago, facing criticism from the BJP over his visit to the Somnath temple during the campaign for the Gujarat election, Rahul Gandhi had said: "Main Shiv ka bhakt hoon, sachaai mein believe karta hoon. BJP jo bhi bole main apni sachaai mein believe karta hu (I am a devotee of Shiv. The BJP may say anything, but I will remain honest.)" On Sunday, it was Congress leader Shashi Tharoor's comments that had the BJP fuming and demanding an apology from Mr Gandhi. Mr Tharoor had quoted the RSS source of a journalist and said that the leader had described Prime Minister Narendra Modi as a "scorpion on a shivling - you can't swat it away and you cannot hit it with a slipper."